Four reinforced concrete beams of rectangular crosssections and four corresponding composite ones consisting of reinforced concrete prisms cast into steel channels with shear connectors were manufactured, loaded, and tested in the laboratory to measure mid-span deflections, and to observe fracture criteria. The reinforced concrete prism of each of the four composite beams is of rectangular cross-section and identical to its corresponding reinforced concrete beam. Load-deflection behavior and fracture pattern at failure obtained experimentally for each of the eight beams were compared with those predicted by a nonlinear three-dimensional finite element analysis using the analysis system computer program (ANSYS V. 5.4) in which the reinforced concrete, the steel channel, and the interaction between reinforced concrete and steel channel were modeled by isoparametric eight-node brick elements, four-node shell elements ,and the five-node interface elements ,respectively. High agreement between the experimental tests and the numerical models was obtained for loaddeflection behavior represented by maximum differences of 11% and 7% for composite and noncomposite beams, respectively. In addition, a perfect coincidence in predicting fracture pattern at failure by the two methods was realized. Comparisons between flexural behaviors for each of the present four pairs of correspondent composite and non-composite beams show that introducing the integrated steel channels highly increases the ultimate load capacity by 155% to 500% -depending on the ratio of steel channel area to gross concrete area, and decreases the ductility ratio by 26.4% to 36.7% - depending on the ratio of steel channel area to tension reinforcement area. 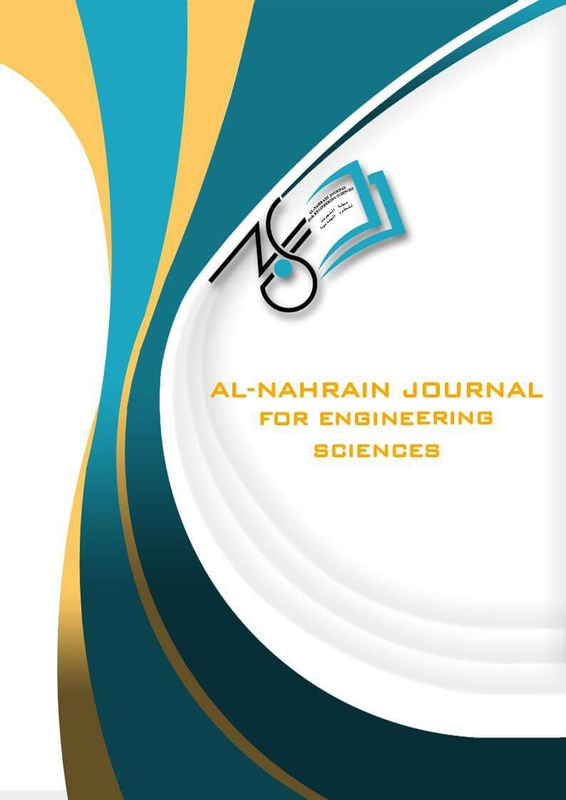 A parametric study on the effect of flange width of the steel channel show that a 40% increase in the ultimate load capacity can be realized by a one-third increase in that parameter with a slight decrease in ductility ratio.تم في الدراسة الحالية التصنيع والتحميل والفحص المختبري لأربعة روافد خرسانية مسلحة ذوات مقاطع عرضية مستطيلة ، واربعة روافد مركبة مقابلة لها تتكون من عتبة ( موشور prim) خرسانية مسلحة مصبوبة في قطعة حديد ساقية مع روابط قص ، وذلك لغرض قياس الهطول في منتصف الفضاءات ولمعاينة ظاهرة التصدع.ان الموشور prism الخرساني المسلح لكل من الروافد المركبة الأربعة ذو مقطع عرضي مستطيل مماثل للمقطع العرضي للرافدة الخرسانية المسلحة (غير المركبة ) المقابلة لها. كما تمت مقارنة سلوك الحمل-الانحراف ونمط التصدع عند الفشل المستحصلين من الفحص المختبري لتلك الروافد ( المركبة وغير المركبة ) مع السلوك المحسوب من قبل التحليل اللاخطي ثلاثي الأبعاد بالعناصر المحددة باستخدام برنامج التحليلات الأنشائية ANSYS V. 5.4 الذي تم فيه تمثيل الخرسانة المسلحة ، حديد الساقية ، والترابط بين الخرسانة المسلحة ومقطع حديد الساقية بالعناصر الطابوقية ذوات الثمان عقد ، العناصر القشرية ذوات الأربع عقد ، والعناصر البينية خماسية العقد ، على التوالي. تم الحصول على توافق عال بين نتائج الفحوصات المختبرية والنماذج الرياضية في سلوك الحمل-الأنحراف والذي يتمثل في قيم قصوى للأختلاف لاتتجاوز نسب 11% و7% للروافد المركبة وغير المركبة ، على التوالي.علاوة على ذلك ، فقد تحقق التطابق التام بين الطريقتين في تحديد نمط التصدع عند الفشل. ان المقارنات بين سلوك الأنحناء - لكل زوج من الازواج الاربعة الحالية للروافد المتقابلة المركبة وغير المركبة - تبين بأن استحداث حديد الساقية المدمج يرفع قيم قابلية التحمل القصوى بنسب تتراوح بين 155% و 500% - أعتمادا على نسبة مساحة مقطع حديد الساقية الى مساحة المقطع الخرساني الاجمالي ، مع خفض نسب المطيلية بنسب تتراوح بين 26.4% و 36.7% - أعتمادا على مساحة مقطع حديد الساقية الى مساحة مقطع حديد تسليح الشد. بينت دراسة مقارنة بخصوص تأثير عرض طوق مقطع حديد الساقية بأن زيادة قدرها 40% في قابلية التحمل القصوى يمكن تحقيقها بزيادة عرض طوق مقطع حديد الساقية بمقدار الثلث ، يرافقها نقصان طفيف في نسبة المطيلية. In case of piles subjected to lateral loading, the failure mechanisms of short pile under lateral loads are different from that of long pile case. The lateral load capacity of pile is limited in lateral deformation of the pile that effected directly on the contact surface area. The results of the 3D finite element analysis for the problem of a single pile under lateral loadings are presented in this paper. The effect of pile shape for both circular and square crosssection on pile response was investigated. Also the influence of slenderness ratio L/B on the pile deformation was discussed in this study. Linear elastic model was used for modeling the piles. Mohr-Coulomb model was used to simulate the surrounded soil. The pile soil interaction composed of 16-node interface elements. A good correlation between the experiments and the analysis was observed in validation example. It was found that the pile response is affected by the amount of loading, the pile cross sectional shape and pile slenderness ratio. The lateral resisting of pile increase in proportioned to the square shape of the pile. In both pile shape, a short pile (L/B = 8.3) gave a small amount of lateral tip deflection than the long pile with a slenderness ratio more than 8.3 for the same amount of loading. Also, the negative base deflection is high for short pile and reduces to zero for long pile.في حالة الركائز المحملة بالقوة الجانبية فان ميكانيكية الفشل للركائز القصيرة تحت القوى الجانبية تختلف منها في حالة الركائز الطويلة. مقدار تحمل الركيزة للقوى الجانبية محددة بالازاحات الجانبية لها والتي تؤثر مباشرة على المساحة السطحية لمنطقة التلامس. نتائج التحليل ثلاثي الابعاد بطريقة العناصر المحددة لمسالة الركيزة تحت القوى الجانبية قد بحثثت في هذه الدراسة. ان تاثير شكل المقطع الدائري والمربع للركيزة على تصرفها قد تم بحثها. اضافة الى تاثير نسبة الرشاقة (L/B) على ازاحات الركيزة قد نوقشت في هذه الدراسة. النموذج اللدن الخطي تم استخدامها لتمثيل الركائز. كما ان نموذج Mohr-Coulomb قد تم استخدامها لتمثيل تصرف التربة المحيطة. منطقة التلامس بين الركيزة والتربة تضمنت عناصر التلامس ذات الستة عشرة عقدة. مقارنة جيدة وجدت بين النتائج العملية والنظرية في مسئلة التدقيق. وجد ايضا بان تصرف الركيزة تتاثر بكمية القوى المسلطة, شكل مقطع الركيزة وايضا نسبة الرشاقة. وان المقاومة الجانبية للركيزة تزداد بشكل متناسب مع المقطع المربع للركيزة. وفي حالة كلا المقطعين فان الركيزة القصيرة ذات الابعاد (L/B= 8.3) اعطت قيم صغيرة للازاحة الجانبية في قمة الركيزة مقارنة مع الركيزة الطويلة مع نسبة رشاقة زادت عن 8.3 لنفس قيمة القوة المسلطة. ايضا, الازاحة السالبة في قاعدة الركيزة كانت عالية في حالة الركيزة القصيرة وتقل الى ان تصل الى الصفر في حالة الركيزة الطويلة. Attenuation --- line-of-Sight --- Propagation --- Remote Sensing. The urinary bladder is probably the only visceral smooth-muscle organ that is under complete voluntary control from the cerebral cortex. Normal bladder function requires interaction of sensory and motor components of both the somatic and autonomic nervous system. Recent advances in the understanding of neural pathways and neurotransmitters have shown that most levels of the nervous system are involved in the regulation of voiding function. Therefore many neuralgic diseases causes changes in the bladder function . In this paper, Number of patients selected from Ibn-Alkiff hospital (for treatment and rehabilitation of Spinal cord injuries), in Baghdad, who were referred to the urology department for complains of some urinary symptoms, and examined by cystometry in the urology out patient and/or inpatient department. These cases were selected randomly who already consult these departments and were followed up and managed by the expert urosurgeons. They were adults complaining of general neuropathic bladder disorder symptoms like frequency, urgency, dysuria, urinary incontinence and were diagnosed as having neuropathic bladder disease, whether: 1. Upper motor neuropathic bladder lesions. 2. Lower motor neuropathic bladder lesions. And finally they were examined by cystometry. The collections of data from patients were about: 1. Accommodation (compliance). 2. Bladder capacity. 3. Contractility. 4. Sensation. 5. Voluntary control. These data with the final definition diagnosis about the neuropathic bladder lesion were processed to 3- layers Neural Network algorithm that was constructed in a matlab computer package. Consequently after all data processing, the neural network model was tested by its capability of processing an already diagnosed neuropathic bladder case and its accuracy in explaining the real neurological bladder behavior of that selected patient.يُعتَبرُ جِهازُ فَحصِ المثانةِ أحدَ الوسائلِ المُهمة في تشخيصِ الامراضِ العَصبية للمثانة ومن خِلاله يُمكنُ استنتاجُ العلاجَ الامثل لمثلِ هذهِ الحالاتِ. الغرضُ منَ البحثِ هوَ تصميمُ شبكةً عصبيةً برامجيةً لديها القابليةُ على اعطاءِ التشخيصِ الاوليِ لحالاتِ المثانةِ العصبيةِ بكلِ انواعِها. أُجريَ العملُ في هذا البحثِ من خلالِ اختبارِ سبعة واربعين حالةِ مثانة عصابية مختلفةِ تم اختيارها بشكل عشوائي في جهاز فحص وظائف المثانة لقياس المتغيرات التالية: 1. التَحَمُلية 2. حجمُ المثانة 3. القابلية التقلصية 4. التحسُس 5. السيطرة الارادية ومن ثم شُخصت الحالاتُ من قبل طبيب اختصاص في جراحة المسالك البولية. هذه المتغيرات مع التشخيص الاولي أُدخلت لتدريب برنامج حاسوبي لشبكة عصبية ثلاثية الطبقات صممت لهذا الغرض باستخدام برنامج matlab . تبعاً لذلكَ تم معالجةُ كلِ البياناتِ وتم اختبار قابليتها على معالجةِ حالاتِ مثانة عصابية مشخصة مسبقا ومدا صحتها في تفسيرِ التصرف العصبي للمثانة لذلك المريض ( اعطاء التشخيص الاولي لحالة المثانة العصبية). وجُد من خلال تطابق النتائج العملية مع المحاكاة الحاسوبية لستة متغيراتهي كل من ( استجابة المثانة الغير مسيطر عليها, الاستيعابية , قابلية الغاء التقلص للمثانة , التواصلية , حالة عضلات المثانة , حالة المثانة العضلية) وتقارب مقبول بين الاختبارين وبنسبة خطأ اقصاها 17% بالنسبة لقيمة اقصى حجم للمثانة الممتلئة. استُنتِج من خلال البَحث ان الشبكةَ العصبيةَ البرامجيةَ المصممةَ في هذا العملِ لديها القابليةُ على استنتاجِ التشخيصِ الاوليِ لحالتِ المثانةِ العصابيةِ بشكل مقارب جداً للتشخيص الذي يمكن استنتاجهُ من جِهازِ فَحصِ المثانةِ وطبيب الاختصاص. In this research, the governing equation of the thin smart beam transverse deflection was derived by the same procedure that the Bernoulli-Euler equation derived but with some additional mathematical terms to be valid for describing the smart beam. The engineering control techniques were used to obtain the solution of the proposed differential equation for the smart cantilever beam where with some auxiliary equations and modifications a block diagram for any type of applied load (static, or cyclic) as the input and the beam deflection as the output was constructed. For insuring an efficient reduction in the beam deflection an integrated system with a voltage amplifier and lead controller was designed. Many cases were studied and simulated including the variation of load nature, and the number of collocated piezoelectric actuator/sensor pairs and in all cases a valuable deflection reductions were obtained.في هذا البحث, لقد تم اشتقاق المعادلة العامة التي تصف الانحراف في العتبات النحيفة الذكية بنفس خطوات اشتقاق معادلة برنولي – اويلر مع بعض المعالجات والاضافات الرياضية لكي تنطبق على العتبات الذكية. إن وسائل هندسة السيطرة قد استخدمت لحل المعادلة التفاضلية المقترحة لحالة العتبة المثبتة من جانب واحد , حيث مع بعض المعادلات المساعدة وبعد عدة اجراءات رياضية تم الحصول على مخطط صندوقي لاي نوع من الحمل المسلط (ثابت او دوري) كمدخل و انحراف العتبة كمخرج. ولضمان الحصول على افضل نسبة من تقليص انحراف العتبة تم اقتراح منظومة متكاملة اضافة الى العتبة الذكية تتكون من مضخم فولطية و مسيطر الكتروني. لقد تمت دراسة عدة حالات منها تغير طبيعة الحمل وعدد ازواج المحفز – متحسس وفي كل الحالات تم الحصول على نسب تقليص جيدة. Turbulent drag-reduction efficiency of polyisobutylene with three different, very high molecular weights was studied in a build-up closed loop gas oil circulation system. The turbulent mode was produced via a positive displacement gear pump to avoid mechanical degradation of polymer chains during the experimental period. Three molecular weights 2.9*106, 4.1*106 and 5.9*106 g/mol dissolved in reformate were used as additives in order to investigate the effect of molecular weight on drag-reduction rate. The effect of polymer concentration was investigated over a range up to 70 wppm in gas oil flow Reynolds number 8341 to 35747 as well as in 1.25 inch inside pipe diameter. A gradual increase of drag reduction and throughput was achieved by increasing the polymer concentration and gas oil flow rate. Friction factor was calculated from the experimental data. For untreated gas oil pipelining, friction factor values lies near Blasuis asymptotes. While by addition of polymer drag reducer into the flow, the friction factor values were positioned towards Virk maximum drag-reduction asymptotes, noticeably for the highest molecular weight type. Furthermore the investigation showed that the degree of molecular weight is significantly in drag reduction performance. Correlation equations were suggested to predict the effect of flow parameters, concentration, flow rate and finally polymer molecular weight on pressure drop reduction. The results of the correlations showed good agreement between the observed and predicted pressure drop reduction values, with a higher than 97% correlation coefficientتم دراسة تقليل الاعاقة الاضطرابي في منظومة جريان مغلقة لزيت الغاز بوجود ثلاث اوزان جزيئية مخلتفة من البولي ايزوبيوتيلين. تم الحصول على الجريان الاضطرابي بواسطة مضخة الازاحة الموجية لتجنب الانحلال الميكانيكي لسلاسل البوليمرية. البوليمرات المستخدمة على شكل محاليل في الريفورميت و تمثل مديات مختلفة للوزن الجزيئي, هي 2.9*610 , 4.1*610 و 5.9*610 غرام/الوزن الجزيئي, بهدف دراسة تأثير الوزن الجزيئي على تقليل الاعاقة و زيادة طاقة الضخ في انابيب نقل زيت الغاز. تم اختبار تاثير تركيز البوليمرات المظافة بحدود تصل الى 70 جزء بالمليون وزنا, علاوة على سرعة الجريان المتمثلة بعدد رينولدز بحدود 8341 الى 35747 في انبوب بقطر داخلي 1,25 أنج. تحصل زيادة مستمرة في تقليل الاعاقة بزيادة تركيز البوليمر المضاف, و سرعة الجريان زيت الغاز. تم حساب معامل الاحتكاك من نتائج العملية لتقليل الاعاقة. تقع قيم معامل الاحتكاك لزيت الغاز الغير معامل باتجاه محاذي بلاسيوس. بينما تتجه قيم معامل الاحتكاك نحو محاذي فيرك عند أضفة بوليمرات تقليل الاعاقة, خاصة للنوع ذي الوزن الجزيئي الاعلى. النتائج العملية تشير بوضوح الى تاثير الوزن الجزيئي العالي على فعالية تقيل الاعاقة. تم اقتراح معادلات تخمينية لتقدير تأثير معاملات منظومة الجريان, و هي التركيز, سرعة الجريان و اخيرا الوزن الجزيئي على انخفاض تقليل هبوط الضغط. نتائج المعادلات تؤشر الى توافق كبير بين قيم هبوط الضغط المستحصلة عمليا و المحسوبة من المعادلات التخمينية بنسبة اعلى من 97%. Drag reduction --- High molecular weight polymers --- Turbulent flow. By achieving simulation of hydrodynamics in a bubble column reactor, have taken an important step towards designing an efficient slurry reactor for large-scale conversion of synthesis gas to liquid hydrocarbons. The simulation allows determining gas holdup, a key variable affecting the reaction rate of gas-to-liquid (GTL) conversion using Fischer-Tropsch (FT) chemistry. This work have two parts, the first part experimental work with bubble column with specific conditions and the second deals with computational fluid dynamics CFD for bubble column have the same geometry and operating conditions. This study is to clarify experimentally the effect of superficial gas velocity on the gas holdup, and the mass transfer coefficient (kLa) where each of them increases as the superficial gas velocity increase. NaCl addition will increase the transition velocity and the gas holdup for certain concentration and superficial gas velocity 2-D simulation was applied in this work. Gas holdup computational results using ANSYS CFX used on Eulerian-Eulerian multiphase model have been compared to experimental data. These results for air-water system were encouraging against the experiment results. بالوصول الى الموائمة الهادرويناميكية للاعمده الفقاعيه التي تعتبر خطوة مهمة باتجاه التصميم لهذه الاعمدة في العمليات الصناعيه. تمكن الموائمة من حساب معامل احتجاز الغاز كعامل مهم في سرعة التفاعلات على سبيل المثال عملية فيشر تروبش. العمل يتضمن جزئين اولهما اجراء التجارب العملية والاخر اجراء الموائمة بواسطة الديناميكية الحسابية للمائع للعمود الفقاعي لنفس الابعاد للعمود المستخدم في التجارب. الغرض من هذه التجارب هو دراسة تاثير كل من سرعة الغاز, اضافة ملح كلوريد الصوديوم بتراكيز مختلفة على معامل احتجاز الغاز و السرعه الانتقاليه. تمت دراسة تاثير سرعة الغاز على معامل انتقال الكتله ايضا. التجارب وضحت ان معامل احتجاز الغاز يزداد بزيادة سرعة الغاز وكذلك معامل انتقال الكتله وعند اضافة كلوريد الصوديوم يزيد السرعه الانتقاليه. الموائمة الثنائية الابعاد استخدمت بواسطة برنامج تشغيلي ANSYS CFX الذي يعتمد على لطريقة الرياضية Eulerian-Eulerian ومقارنتها مع النتائج العملية وكانت الطريقة الحسابية مشجعة لتقاربها من النتائج العملية. This paper presents the design and implementation of a sniffer detector system which can be used to detect any host running a sniffer on an Ethernet network. The proposed detection system is based on two effective detection techniques: the ARP (Address Resolution Protocol) detection technique and the Three-way Handshaking detection technique. The first technique, the ARP detection, attempts first to send trap ARP request packets with faked hardware addresses, to a suspicious sniffing host. Then, based on the generated responses of the suspicious sniffing host, a decision is made on whether or not the suspicious host is running a sniffer. In case of no response the second technique, the Three-way Handshaking detection, is used to detect active sniffer which did not respond to the first technique by sending trap TCP-SYN packets with faked IP address, to a suspicious sniffing host. Based on the generated responses of the suspicious host, a decision is made on whether or not it is running a sniffer. The two techniques are implemented in a system that automatically gives the system administrator a helping hand regarding the detection of sniffers on an Ethernet network. The proposed system is tested in comparison with three other available anti-sniffers (L0pht AntiSniff, PromiScan, and PromiscDetect). The results showed its enhanced performance.يقدم هذا البحث تصميم وتنفيذ نظام كشف ضد إستراق المعلومات الذي يمكن استخدامه لاكتشاف اي مستخدم يدير برنامج إستراق المعلومات على شبكة Ethernet. نظام الكشف المقترح يستند على تقنيتي الكشف الفعالتين: تقنية كشف (ARP) Resolution Protocol Address وتقنية كشفThree-Way Handshaking. التقنية الاولى ARP ترسل اولا رزمة طلب Trap ARP Request بعناوين حاسبات مزيفة، الى المستخدم المشتبه به. ثم استناداً الى الردود المولدة من المستخدم المشتبه به، يتم تحديد فيما اذا كان المستخدم يدير برامج إستراق المعلومات. في حالة لا ردود، التقنية الثانية Three-way Handshaking سوف تستخدم لكشف برامج إستراق المعلومات المتقدمة التي لم تستجب للتقنية الاولى بارسال رزمة TCP-SYN Trapبعنوان IP مزيف الى المستخدم المشتبه به. ثم استناداً الى الردود المولدة من المستخدم المشتبه به، يتم تحديد فيما اذا كان المستخدم يدير برامج إستراق المعلومات. تم جمع التقنيتين في نظام يعطي مدير النظام الياً يد المساعدة بخصوص كشف برامج إستراق المعلومات على شبكة Ethernet. النظام المقترح اختبر بالمقارنة مع ثلاثة انظمة اخرى متوفرة مضادة لاستراق المعلومات. النتائج اظهرت انه الافضل اداءاً. Multiplication is an important part in real-time digital signal processing (DSP). The present work deals with the design and implement of complex multiplier/mixer using Field Programmable Gate Array (FPGA) chip with low cost and high speed. Two devices of FPGA are chosen to implement the design; to achieve the task of mixer system implementation. The rules that are important for such implementation are proposed in order to reach the minimum cost and high speed requirement for the individual component of mixer system. These components are software simulated using VHDL language, with software called MODELSIM version SE-EE5.4a. Since mixer is important in any digital receiver because of high speed need, so different multiplier method are proposed with different data resolution and different worst case of additional noise. To achieve high speed data, a parallel tree multiplier is used with Wallace tree method which is optimal in speed but it has a complicated routing that makes it impractical to implement, because of this, we present a modification for fast parallel multiplier using both Wallace tree and Booth algorithm to achieve a sufficient design for most of DSP application. The proposed design of mixer is simulated using ISE4.1i and results in successful achievement of its desired specification. The final implementation of programmable (4, 8, 16, 32 and 64) bit mixer data input resolution is achieved using Virtex-II devices and also implemented in LP-2900 CPLD device. The resulting performance depending on multiplier method are viewed in mixer cost. However, the routing is much more regular with great reduction in FPGA cost and it is achieved for the desired mixer when compared with other methods. ان عملية الضرب هي عملية مهمة في اعطاء نتيجة واقعية لتطبيقات معالجة الاشارة الرقمية.يتعامل هذا البحث مع تصميم وتطبيق الة عقدية لضرب الارقام (complex multiplier (mixer باستخدام شريحة الكترونية قابلة للبرمجة (FPGA) بكلفة قليلة وسرعة عالية. اختير جهازين من ال(FPGA) لتطبيق التصميم والوصول لمهمة الضارب العقدي. تم افتراض الشروط المهمة لهذا التطبيق لغرض الوصول الى اقل كلفة واعلى سرعة. استخدمت لغة ال(VHDL) لتصميم البرامج وتم تطبيقها في برنامج (MODELSIM) من نوع (SE_EE.5a). بما ان الضارب العقدي هو جزء مهم في اي مستلم رقمي, استخدم ضارب من نوع شجرة والس للوصول الى السرعة العالية مع انه ضارب معقد وغير عملي في التطبيق.لذلك تم اجراء تعديل عليه باستخدام ضارب شجرة والس مع خورازمية بوث للوصول الى التصميم المطلوب في معظم تطبيقات معالجة الاشارة الرقمية. تم الحصول على نتائج جيدة بمحاكاة تصاميم الضارب العقدي باستخدام برنامج(ISE4.1i) . للحصول على الدقة المطلوبة, استخدمت مدخلات البرامج المصممة (4 بت, 8 بت , 16 بت, 32 بت , 64 بت) وطبقت باستخدام (Vertix II) كما طبقت في .يتوضح اداء النظام المصمم من خلال (LP-2900 CPLD) الكلفة الناتجة. Digital Communication --- VHDL --- FPGA --- ISE4.1i --- Virtex-II --- Wallace tree --- Booth algorithm. The work reported in this paper presents a new method for the performability evaluation of the token ring network. Performability is a term used to describe performance and reliability. Performance is defined as “quality of service provided the system is correct”. Reliability is “the property of a system which allows reliance to be justifiably placed on the service it delivers”. However, the problem that arises from evaluating these items separately is that performance depends on reliability. Thus, it is obvious that combining performance and reliability was needed for a complete evaluation; the issue was how to combine them. The method used for performability evaluation of token ring network is based on analysis describing the action of the token ring network. It was assumed that the Mean Time Frame Transfer (MTFT) to be the main measure of the performability which is composed of the Mean Waiting Time (MWT) for a free token and the Mean Real Transfer Time (MRTT) of a data frame (together with the acknowledgement receipt), taking in consideration all possible malfunctions. In addition, the influence of the effective parameters [number of nodes (N), length of the link (L), channel bandwidth (b), exponential distribution ratio of the user access probability (λ) and ratio of malfunctions (km)] on MTFT and its components were investigated. As a general conclusion the present investigation provides a new method for evaluation of performability of the token ring network. It was found that the Mean Time Frame Transfer and its two main components vary linearly with number of nodes, length of the link, exponential distribution ratio of the user access probability and the ratio of malfunction and vary inversely with channel bandwidth. Optical phase-conjugation (OPC) was observed in Rose Bengal dye-doped gelatin films via Degenerate four-wave mixing (DFWM) using continuous wave of SHG of Nd-YAG laser radiation ( =532 nm) of total power 50 mW. Various parameters which influence the phase-conjugate (PC) signal during the DFWM process were studied. The PC signal contributions from induced holographic transmission and reflection gratings were measured. It observed a maximum PC beam reflectivity of 0.15% in these dye-doped gelatin films.في هذا البحث تمت ملاحظة الاقتران الطوري البصري (Optical Phase Conjugation) لصبغة الــ (Rose Bengal) المطعمه باغشية الجيلاتين بواسطة تقنية انحلال اربعة امواج ضوئية متمازجة (Degenerate Four Wave Mixing) باستخدام اشعة ليزرية ذات موجه مستمره للتولد التوافقي الثاني من ليزر النديميوم - ياك ذي الطول الموجي (532) نانومتر وبقدرة كليه مقدارها 50 ملي واط.ان العديد من المعلمات والتي تؤثر على اشارة الاقتران الطوري(phase conjugated signal) خلال عملية الاقتران الطوري البصري قد تمت دراستها . كذلك تم قياس أثر مساهمة الحيود ( الانتقالي والأنعكاسي ) على اشارة الاقتران الطوري , كما تم ملاحظة اعظم انعكاسيه لحزمة الاقتران الطوري بمقدار 0.15 % لهذه الصبغه المطعمه بأغشية الجيلاتين. The objective of the present study was to investigate the effect of temperature in order to improve the efficiency of the RO desalination process, and analyze the concentration polarization in spiral wound salinity water membrane elements. In this study the commercial reverse osmosis membrane (cellulose acetate) have been used to treat medium concentrated (NaCl) salt solutions up to 1200 ppm. The results of the experiments show that the polymer membrane is very sensitive to changes in the feed temperature, and the concentration polarization variation with increase in flow rate and with decrease in temperature. The nonlinear equation obtained is solved numerically using the Marquardt method to determine various parameters. The k values estimated from the model show a marked variation that may be attributed to the presence of reflection coefficient in the Spiegler-Kedem model. It is suggested that the combined Spiegler- Kedem/film theory model may be the best method for establishing the mass transfer correlation for a given membrane of reverse osmosis and nanofiltrationإن هدف هذا البحث هو لدراسة مدى تأثير تغير درجة الحرارة للمياه الداخلة على كفاءة عملية التنافذ العكسي وعمل المنظومة و كذلك لتحليل ظاهرة تركيز الاستقطاب( concentration polarization) التي تحدث في أغشية التنافذ العكسي من نوع (Spiral wound) والمصنع من مادة السليلوز اسيتيت مع استخدام المحلول القياسي((NaCl-water لغرض الاختبار بتراكيز تصل إلى 1200ppm. إن النتائج التجريبية التي تم الحصول عليها تبين إن الغشاء البولمري ذات حساسية جدا عالية لدرجة الحرارة وان ظاهرة تركيز الاستقطاب تقل بزيادة معدل الجريان وبزيادة درجة الحرارة. إن المعادلة الغير خطية التي وضعت حلت بإحدى أساليب الطرق العددية مستخدمين طريقة ( (Marquardt لحساب المتغيرات ولإيجاد معامل انتقال الكتلة مستخدمين بذلك الموديل الرياضي (Spiegler–Kedem / film) علما أن هذا الموديل ناجح التطبيق لعملية التنافذ العكسي ولعملية ((Nanofiltaration. Biomedical signals are generated by complex self-regulating systems that process inputs with a broad range of characteristics. Many physiological time series, such as the fetal heart rate, are extremely inhomogeneous and non-stationary, fluctuating in an irregular and complex manner. In this project, the amplitude of low-frequency fluctuation of fetal heart rate frequency was studied using analysis called wavelet transform. The nature and maturational changes of low-frequency fluctuation of the FHR in normal fetuses were investigated and probability distribution of FHR wavelet coefficients was studied from 28 wk of gestation onward. The value of the parameter a of this distribution did not exceed 1.939 regardless of the gestational age in a normal condition. The value of index a range from 2.1585 up to 3.1652 in fetuses from pregnant women with pregnancy-induced hypertension. This project also presents a system capable of calculating index for the fetal heart rate low-frequency fluctuation distribution value and uses it to identify the fetus condition using the MATLAB 7.3 package. FHR data of 12 normal fetuses and 18 fetuses from pregnant women with pregnancy-induced hypertension all between 28 and 38weeks of gestation were studied. First, the cardiotocography tracing was converted from CTG paper images into digital series using image processing so that the system can analyze it. The FHR was then converted to inter-heart beat time series. Biorthogonal wavelet transform was used to analyze inter-heart beat time series. The histogram of the absolute value of resulting wavelet coefficients was analyzed then probability distribution of wavelet coefficients frequency was used to calculate the fluctuation parameter a. Statistical analysis methods where used to compare between the results. The Kruskal-Wallis test was used to test the significance of the difference among the parameters obtained; Pearson’s test was used to test goodness of fit of the distribution function. In addition, the t-test was used for other statistics. Index a values were used in last stage of the system to identify sick fetuses. When analyzing fetal heart rate of 18 fetuses from pregnant women with pregnancy-induced hypertension the system succeed to identify the presence of a problem in 6 fetuses الموجات الطب-حياتية تتولد بواسطة أنظمة معقدة ذاتية الضبط تعالج الإدخالات بواسطة مدى واسع من الخصائص .العديد من السلاسل الزمنية الوظائفية, مثل معدل نبض قلب الجنين,غير متجانسة إلى ابعد حد وغير ثابتة, تتموج بأسلوب معقد وغير منتظم. في هذا المشروع, قيمة تموج التردد المنخفض من ترددات معدل نبض قلب الجنين تمت دراسته باستخدام تحليل يدعى تحليل المويجة. طبيعة وتغيرات النضج لتموج التردد المنخفض لمعدل نبض قلب الجنين في الأجنة الطبيعية تم التحقق منها واحتمالية توزيع معاملات المويجة لمعدل نبض قلب الجنين تم دراستها من الأسبوع الثامن والعشرين للحمل فأكثر. قيمة المعامل a بالنسبة لهذا التوزيع لم تتجاوز1.939 بغض النظر عن مدة الحمل في الحالات الطبيعية. قيمة a تتراوح بين 2.1585 حتى 3.1652 لأجنه من نساء حوامل مصابات بارتفاع ضغط الدم الناتج عن الحمل. هذا المشروع يقدم أيضا نظام قادر على حساب مؤشر لقيمة تموج توزيع التردد المنخفض لمعدل نبض قلب الجنين واستخدامها لتعيين حالة الجنين باستخدام برنامج مختبر المصفوفات 7.3. لقد قمنا بدراسة بيانات معدل نبض قلب الجنين لاثنى عشر جنينا طبيعيا وثمانية عشر جنينا من نساء حوامل مصابات بارتفاع ضغط الدم الناتج عن الحمل جميعها بين ثمان وعشرين وثمان وثلاثين اسبوعا للحمل. أولا, تم تحويل تخطيط قلب الأجنة من صور لأوراق التخطيطCTG إلى متسلسله رقمية باستخدام معالجة الصورة ليتمكن النظام من تحليلها ثم تم تحويل معدل نبض قلب الجنين إلى متسلسله زمنية للزمن مابين نبض القلب. تم استخدام تحليل المويجة ثنائي التعامد لتحليل المتسلسله الزمنية للزمن مابين نبض القلب. تم تحليل الرسم البياني العمودي للقيم المطلقة لمعاملات المويجة الناتجة ثم تم استخدام توزيع الاحتمالية لتردد معاملات المويجة لحساب معامل التموج a . تم استخدام طرق تحليل إحصائية للمقارنة بين النتائج. استخدم اختبار كرسكال-والاس لاختبار وجود فرق ذي أهمية بين المعاملات الناتجة؛ كما استخدم اختبار بيرسون لاختبار جودة ملائمة معادلة التوزيع.إضافة إلى ذلك , تم استخدام اختبار - ت للإحصائيات الاخرى0تم استخدام قيمة a لتعيين الأجنة الغير طبيعية0 عند تحليل معدل نبض قلب الجنين لثمانية عشر جنينا من نساء حوامل مصابات بارتفاع ضغط الدم الناتج عن الحمل تمكن البرنامج من الكشف عن وجود مشكلة في ست من هذه الأجنة.